Why did you enter the industry? I have grown up around race cars, show cars and basically anything that has an engine. I realised at a very young age that I had a love and passion for anything automotive. I enjoy tinkering and working in the garage and at race tracks whenever I get the chance. As I have grown older there has been a great influence on me to enter the industry and make a career out of something I love to do. Throughout my schooling I have always enjoyed anything that is hands on and have exceeded at those subjects and tasks. During my school holidays I would work at a family friend's paint and panel shop. I developed a liking for working on custom cars, the owner would compliment me on my high standards and quality of work for a beginner. I try to be the best I can be at any given challenge. I entered the industry knowing that it will be a hard challenge being a female but I have overcome those hurdles and have excelled in every aspect that has been asked of me. I find myself looking and thinking outside the box as I work hard to achieve my goals and aspirations to one day owning my own workshop. I set myself goals when I first started my apprenticeship to work hard and hope that with my hard work and dedication to be nominated for Apprentice of the Year. How do you add value to your workshop? I believe I add value to the workshop and my fellow colleagues by aspiring to be willing and eager to learn all aspects of the trade. I come to work with a level head, passionate, diligent, meticulous and overall open minded. In my opinion I take the initiative and don't wait to be told when I know it is something I can accomplish. I have a high attention to detail and will complete any given task to the best of my ability from start to finish. My colleagues have faith in my ability and believe in me and that's all I could ask for. I'm also willing to take the initiative to deal and communicate with customers and answer the phones when other staff members may not be available. I find working in a friendly and functional team environment to be of great assistance with my apprenticeship. Provide an example of when you have gone above and beyond for a customer. I had an experience recently where one of our loyal customers phoned the workshop just before closing time on a Saturday, my boss was unavailable as he was pre-occupied elsewhere with another customer and their vehicle. The lady was curious to see if we were still open for business, and if we were, could she call in to have a headlight globe replaced that had blown. Without any thought or doubt I was willing to go out of my way as it was after closing time. I assisted her and asked if she wanted to bring her vehicle in now. Her response was that she will come right away as she was nearby. When she arrived I went out and assisted her and inspected all other lights on the vehicle. The lady was very appreciative, but unfortunately we did not have a globe in stock, I went to our local trade store, purchased the correct globe and returned to install it. As a valued customer we did not charge for such a small service. Customer left very satisfied. How do you continuously learn and develop new skills? Having a passion for anything automotive or mechanical makes learning easy, I have my apprenticeship school studies to work through, we have regular training nights, and online training organised by the business, I’m always willing to take advice from my peers and any knowledge they can pass down. 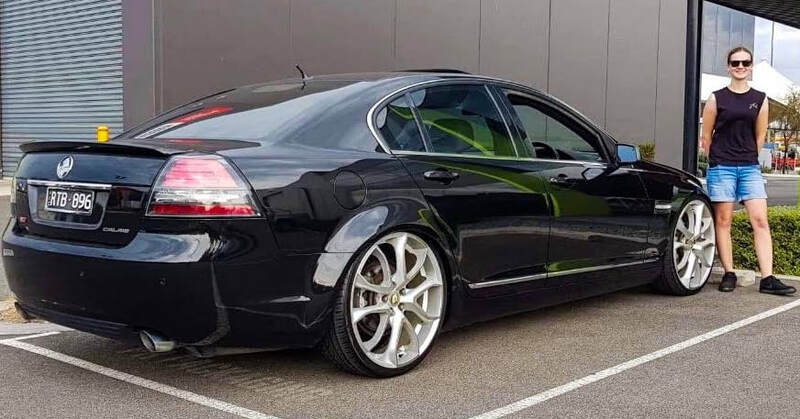 I have family, friends and acquaintances who are involved in many different ways in automotives that can help me see many different sides to the industry, I find that they are all a wealth of information and always willing to teach me their many and varied skills. I am interested through our race car engine builder (Dandy Engines) in tuning and data logging, as well as dyno tuning and the building of drag car engines and specialised race engines for different applications. The business I’m currently working at is still a relatively young and is progressively growing, I’d like to think that I would still be with my current employer and perhaps in more of a leadership or a management position. I hope to progress in my learning’s and build on my teachings and life experiences to achieve a higher sense of accomplishment in different aspects of the Auto Industry. I hope to meet people on my journey who can contribute and mentor me to achieve my dreams and aspirations and turn them into a reality. What excites you the most about working in the auto industry? I love working in the automotive industry because everyday there’s always something different to work on and you’re always learning something new. Everyday there’s a new challenge that brings your problem solving skills into place. The way technology has advanced over the previous decades to what it is now and the way it’s going to evolve in the future really excites me. I have seen another side of the Industry with Performance engines. Our race car engine is built by Dandy Engines, it is very interesting to go and see the development and different areas of expertise. They have encouraged me to go there on a weekend and help out and will fully support me with my future endeavours. What are your interests within or outside of the auto industry? Growing up I was surrounded by motorsport, my Dad and Pa have been and are still involved with Speedway Racing, so naturally I have a passion for motorsports, I love to go Go-Kart racing and have recently purchased my own Kart. I enjoy going to car shows and seeing other people’s creative ideas and the way they have gone about certain things with their vehicles. I aspire to their aspirations and the quality of their workmanship and dedication that also encourages me to utilise their dedication towards my daily work. ​I own a 1972 Leyland Mini that was handed down to me from my Aunty Lorraine when she passed away, I’m very passionate about the car and the memories that come with it. The goal is to restore it to the way I want it and enjoy it as much as I can. I also love spending time with my family and my 3 dogs whenever I get the chance and no matter how your day went, they’re always happy to see you. Do you have any other recommendations to improve the apprenticeship system? So far through my apprenticeship I have encountered some brick walls. My first year I attended Chisholm TAFE and felt I was being held back, the teachers wouldn’t sign me off on modules due to the quickness of time I took to complete them. As the schooling is now self-pace, I feel as though the students aren’t benefiting from it as everyone is at different stages, the teacher is there to oversee the work you are doing and barely assisting you. My second year I have changed training organisations and am signed up with NextGear. I changed from Chisholm due to them not meeting mine nor my employer’s expectations. I felt as though it wasn’t benefitting nor satisfying my needs and the expectations I set for myself and where I want to head in my career. So far I am satisfied with the assistance NextGear have provided me. They visit the workplace on a monthly basis and regularly check in to see how you’re travelling with the work provided, I am now on my second trainer and the new trainer is organised and seems to care more about the students, education and resources NextGear is providing and how it can be more beneficial to the students. In my opinion, many students are coasting through the system and not learning or retaining any information and/or skills and it’s scary to think they are going to be working on people’s vehicles in the future. 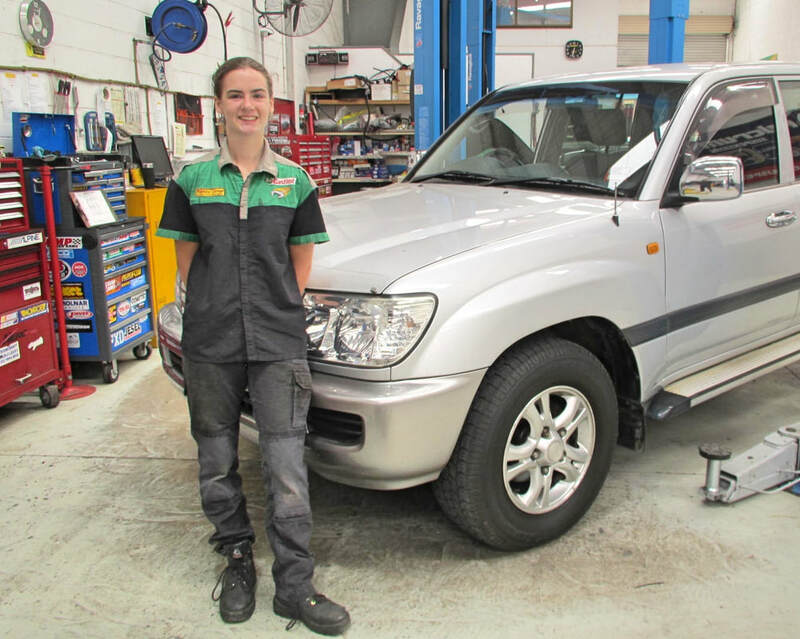 Caitlyn (18 years old) is in the third year of her apprenticeship and originally started working at Alpheys Garage as a cleaner after school in year 10 (2016). Halfway through that year she started working there in her school holidays and by the end of the 2 weeks, Ian had offered her an apprenticeship. After lots of discussions with Mum and Dad, the decision was made that she could accept the offer, for which she is thankful to Ian (Manager) for believing in her ability to become a mechanic. 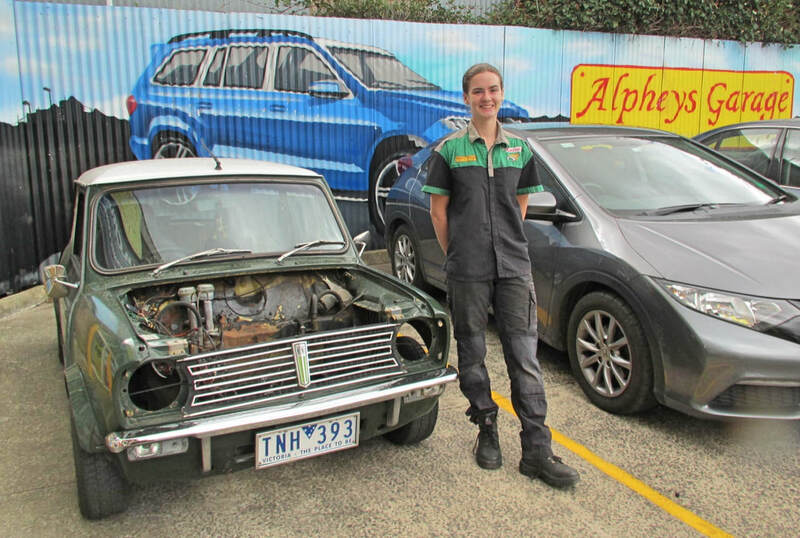 Caitlyn will do an engine upgrade (998cc) and a full restoration on her 1972 Leyland Mini Clubman. (See photo 2). Safety Tip from Caitlyn: Ensure that the people servicing and maintaining your car are qualified to be repairing your vehicle. Unfortunately it is not a licensed trade as yet, and you could be putting your life and other road users lives in danger. Alpheys garage can work on most vehicles. It includes servicing, engine tuning, brakes, exhaust and suspensions. Their services also now include air-conditioning and repairs, auto electrical and vehicle restorations/paint and panel. ​If it’s unfamiliar, they have a great network of support as well as having loads of technical information available through their affiliates. Note: Met with Caitlyn and Ian in 2018 and the article was completed in February 2019. First 3 photos: Caitlyn, Photo below: Ian Alphey - Manager / Owner and has over 30 years mechanical experience.